I love cheap labels! They are sometimes called Rip Off labels, but I prefer to speak of exploitation labels. In case you don’t know what I am talking about: it are labels that specialise in cashing in on the successes of others. These record companies have existed since (and probably before) records were invented, but they had their hay days in the 60’s and 70’s. They are not all the same: some are worse than others. The worst exploitation labels try to sell their own lousy recordings as hits by the original artists. I love these records. Other labels try to sell covers of original hits for a much lesser price than the original hits. I love these records too. Some labels hope to sell their own music by putting a cover of a hit on the record (and the title of that hit song big on the sleeve). I love these records most of all. In the 60’s and 70’s there were too many exploitation labels to mention here. I will gladly do that an other time. One of my favourite labels is Europa. On their exploitation LP’s they almost always put some tracks, that are not what you would expect on basis of the title. 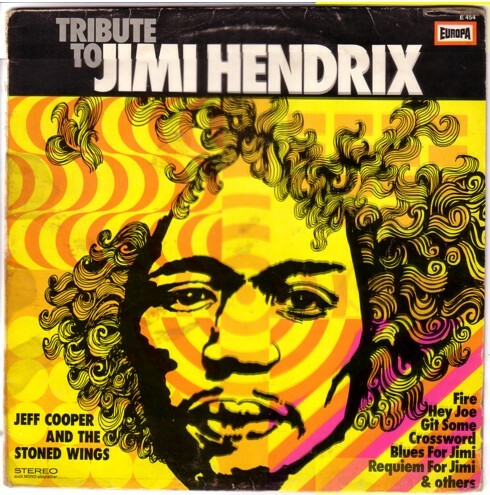 Take for example Tribute to Jimi Hendrix . The words ”Tribute to” are so small that it is clear that they hope you will overlook them. But for the people that indeed overlooked these words, it must have been a disappointment that there are only two covers of Jimi Hendrix songs. 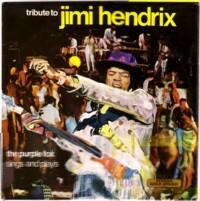 The other eight tracks are original recordings, in the same style as the hits that made Jimi Hendrix rich and famous. Of course, I am not disappointed at all by these eight original tracks. I am not a particular fan of the music of Jimi Hendrix and this Polish impersonator is doing a great job. The only drugs he ever used where probably the exhausts from the local Lada’s, but his attempts to sound like a dope head are far more impressive than many of the real stoned records that I have heard. And much shorter. To make this long story even a bit longer: the same record was also released by another famous exploitation label ( Stereo Gold Award ), but under a different tile and with a different name for the artist. Here our Polish hero goes under the name of The Purple Fox. His real name was Alex Bloggs, by the way. But what’s in a name in this business.